The Nintendo Switch doesn’t have Overwatch and while we all hope that one day Blizzard will bring the mammoth title to the hybrid console, for now we have Paladins. And despite it not quite capturing the same personality as Overwatch – the characters feel a little more cookie cutter and generic – the thirst for a team-based game with a variety of champions to choose from is sated here. In other words, if you want a shooter with team elements of holding objectives, but also with deathmatch options, Paladins has your back. I’m going to be totally transparent here; firstly the developer Hi-Rez Studios sent us a code for the Founders Pack, so I had access to every champion that has so far been released. Secondly, it’s worth noting that this is a game that has already been out for some time on other platforms and comes to the Switch with a ludicrous amount of content. I mention this because when I first loaded up Paladins, I felt entirely lost. There was an event going on and information about what it was and how I could take part, was scarce. There are over thirty different champions to play as, who all have different abilities and playstyles. They can all be upgraded, unlocking new offensive and defensive moves; there are chests to win and open, rewarding the player with new skins, emotes and sprays and there’s a battle pass, which is becoming an increasingly common addition. All told, Paladins, at first, is an overwhelming experience. Some digging around through the myriad menus, I found a training option which allows for practice with each champion in all of the different modes of play. To keep things simple, I jumped into a training version of team deathmatch, which interestingly can populate your team with real people also looking to train, while the opposing team will comprise of AI bots. It certainly didn’t feel like I was jumping in at the deep end, but there was still a sense of being pushed into the pool with no lessons on how to swim. Had the game opened with a generic training simulation, I might have felt more prepared, but this had to do. I ran around the map after choosing a random champion, hitting buttons in the hope that the abilities I was triggering would benefit my character and team. As with Overwatch, each champion has a range of skills set to buttons. Using them triggers a cool down period in which it becomes unavailable. I don’t remember the name of the champion I chose, but one button caused me to teleport backwards, another threw out a sludge ball which I think slowed down enemies walking through the area of effect. What’s most important here though, is that I had fun. The mechanics and deathmatch style was reminiscent of Quake, in that you simply shot and killed the opposing team before spawning back in to do it again. The simplicity became key. While I did end up trying other modes – one of which requires you to defend a payload – I kept coming back to the deathmatch. Every team I played on felt balanced, even if we were missing a medic, we rallied on, despite the lack of voice chat. Maps were set out to create nice hot spots of action allowing for straight out gunfights. These moments allowed for flanking champions to play to their strengths and loop around the action to take out enemies from unprotected areas. Suddenly, the game began to just click into place. I juggled through a few other champions, levelling them up with my hard-earned gold which came from end of match results. The better you perform, the more money you’ll get, which translates to new levels offering passive and active abilities. Learning on the fly is key to Paladins, as is experimentation. I ended up finding a tree-like creature called Grover who fit my playstyle. His standard attack was a throwing axe he spawned from his body, though hitting the ZL Button would throw a more powerful version with a short cooldown. If I tapped the L Button I could heal my teammates, whereas the R Button would throw out a vine to either pull me across the map or bring an enemy closer. Then each champion has a super skill, which takes a much longer time to build up. Grover’s skill was rapid healing for the team which spread in an area of effect. His passive skills which could be changed as he levelled up could lean on more passive healing, or a later skill allowed for increased damage the further you are from the opponent. Again, it’s a lot to take in and this is just one of many playable champions. At times, the game feels a little too close to Overwatch, but as Switch owners have no opportunity to play that game, this suffices and comparisons are forgivable. There are ‘Play of the Game’ style recaps at the end of each match which highlights a certain player for their skill. Characters level up, but also your general account does too, which contributes to the battle pass and many other aspects. There seems to be a million different things to unlock and previous seasonal items show that the team at Hi-Rez Studios certainly offer options in constant updates. This ‘review’ is nearing 900 words and yet, I feel I’ve not really talked about the game mechanics and how they feel. That’s because, to be honest, it feels like every other shooter out there, except with varying abilities. The balance seems fine as you can only have one of each character on teams, there’s a huge scope to find a champion that fits your playstyle and the maps, while a little generic are pretty and feature all the sites you’d expect – choke points, open areas for snipers and verticality for options to get the higher ground. It’s all very competent, which is, frankly, a compliment. Paladins isn’t going to dominate because there’s just so much to take in and unless you want to spend hours soaking up character descriptions and lore, the champions are basically faceless avatars who differentiate through their skillsets. Yet, I feel like I’m sending Paladins up the river, because the time I spent with the game was some of the most fun I’ve had with a shooter on Switch. Usually I find them a little clunky, but Paladins is a smooth experience that teaches you to play through actually playing. The addition of limited time events which bolster the underlying storyline are fun, but again, a lack of explanation does limit the joy to be had. There’s one going on right now and I don’t feel I could tell you anything about it without Googling what is actually occurring. All I know is that there’s a large demon creature and you have to fight each other after climbing a tower of obstacle courses to reach him. When one team wins, a hero shows up, spouts some dialogue and you get the chance to play again. Paladins could be amazing, but it’s all a bit too convoluted. As it stands it’s still a great experience, but for casual players who just want a team-based shooter, they may find the list of options a little too long. But it’s fast-paced with solid shooting mechanics and although some of the champions are a little generic, it’s trying, which is more than others can say in the shooting genre. When Switch eventually gets the free to play version, I’d highly recommend everyone gives it a try – find a champion that fits and you’ll have a blast, especially if you play with friends. This is all comes from just ten hours in the game. I don’t feel like I’ve really scratched the surface, which is why I’ve decided to update this review as time passes. I think this statement shows two things, an intent to report on how the game evolves, but also the fact that it’s a bloody good game that I want to continue playing. 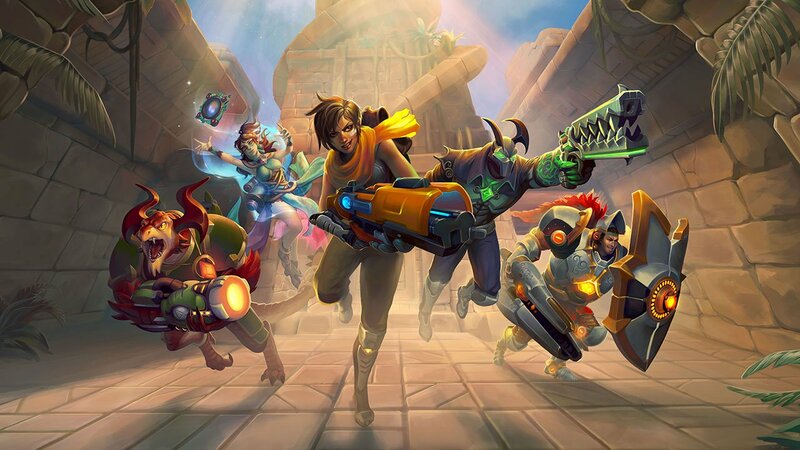 It’s a game that will stay on my Switch and I’ll dip into for an hour or so every day, working out the kinks and nuances, enjoying exploring champions and events for as long as Hi-Rez Studios keeps it on their minds.